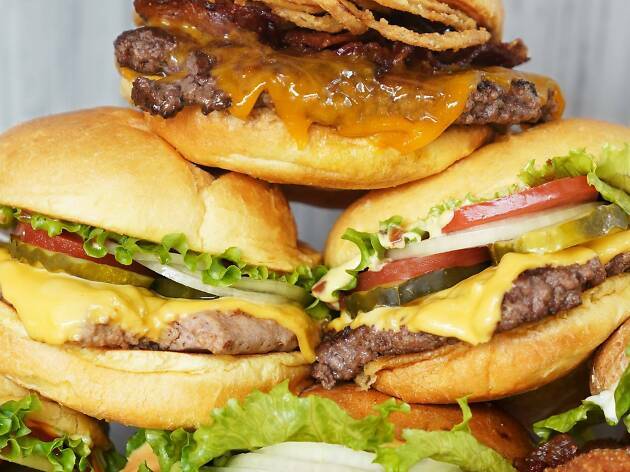 Here's Where to Find the Best Smashburgers in L.A.
Worldwide icon-chevron-right North America icon-chevron-right United States icon-chevron-right California icon-chevron-right Los Angeles icon-chevron-right Smashburgers are taking over L.A. Here are seven spots to find them. Smashburgers are taking over L.A. Here are seven spots to find them. 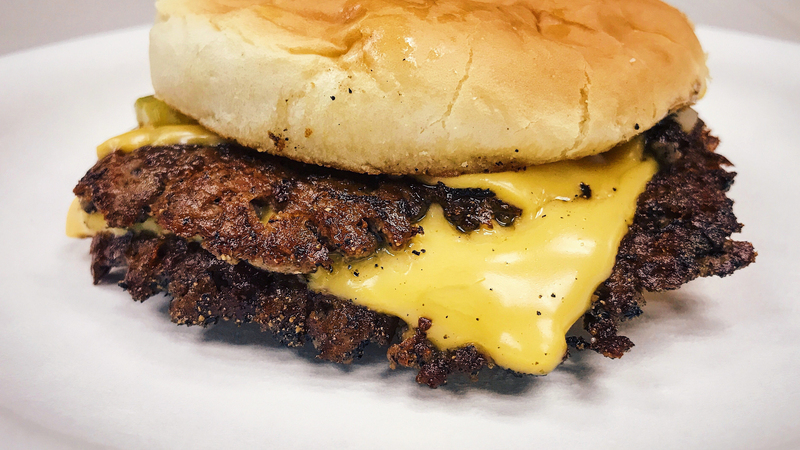 There’s almost nothing more intoxicating that the smell of a smashburger—except, of course, the taste. Angelenos are learning this quickly, as pop-ups and even established neighborhood spots start adapting to the style. 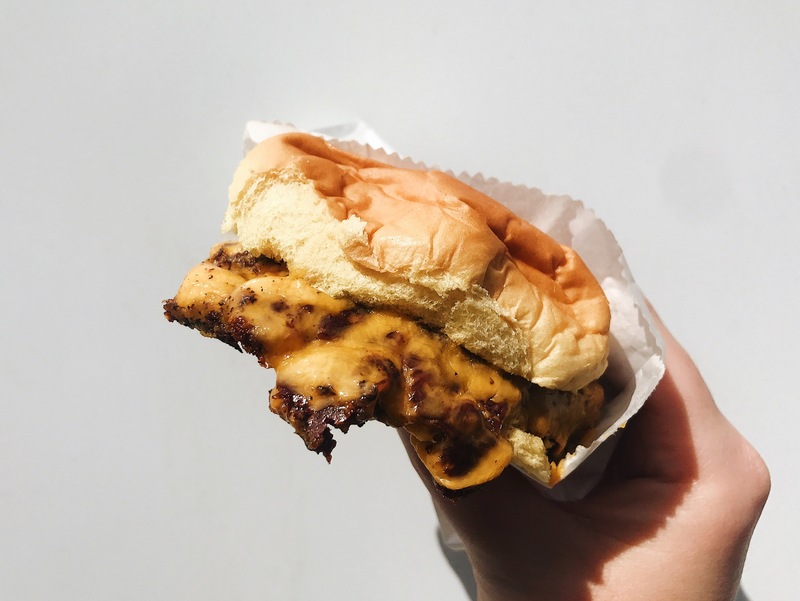 Smashburgers are hardly new, but they harken back to a bygone era in food when patrons reveled in the novelty of dining in their cars and all a burger needed was a good sear and a squirt of ketchup. 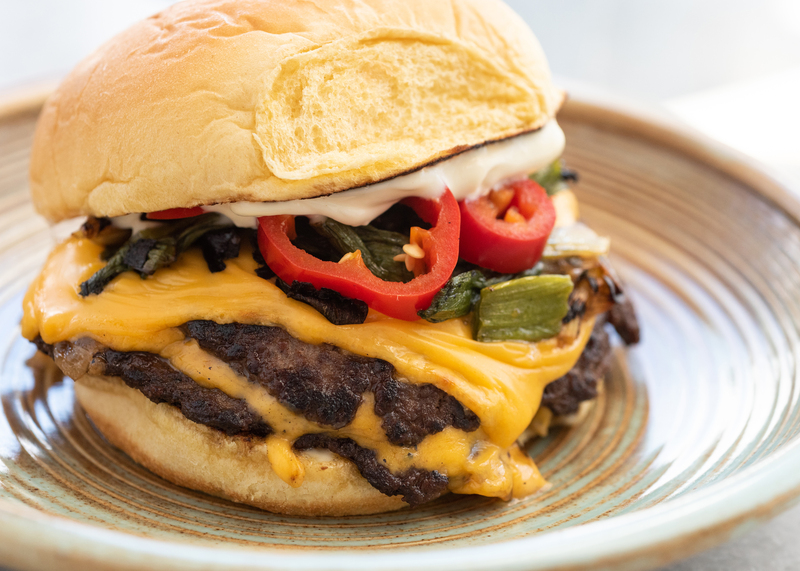 Seasoned vigorously to tenderize and flavor the almost pancake-flat beef patty, this variety of burger sizzles in its own juices—pressed out during cooktime—and fries on a flat-top grill, practically caramelizing a thin outer shell of crust on the meat. 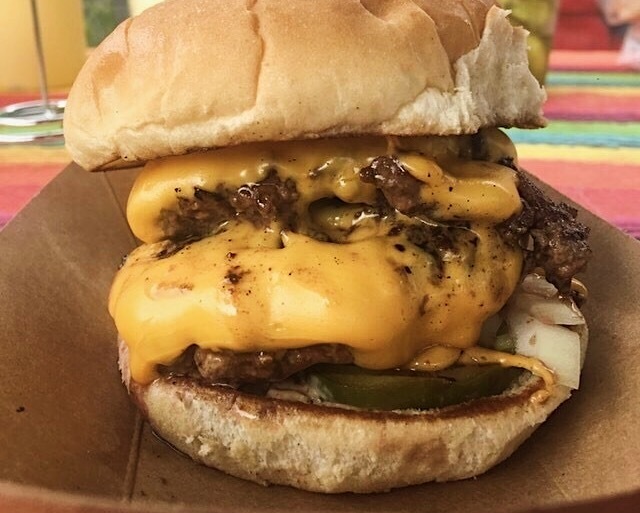 We’ve got to admit, the interest in simply-prepared and gloriously greasy smashburgers is a breath of fresh air, especially after we’ve eaten through decades of piled-high gourmet toppings and inches-thick patties almost too big to fit our mouths around. 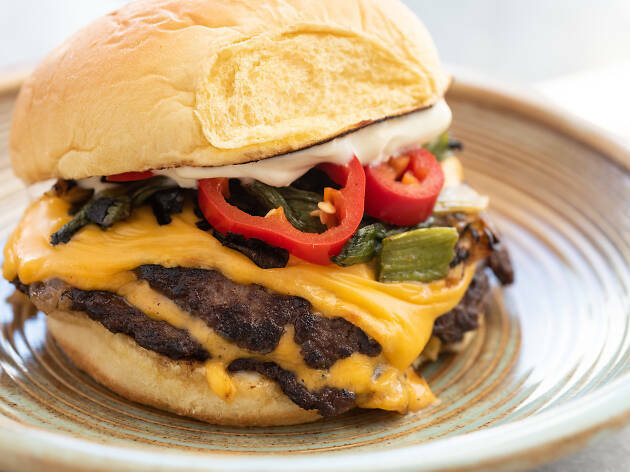 We welcome L.A.’s smashburger overlords, and while there are phenomenal diner burgers and smashburger-adjacent options almost everywhere you look, here are a few of the city’s best and newest additions for true smashburger bliss. 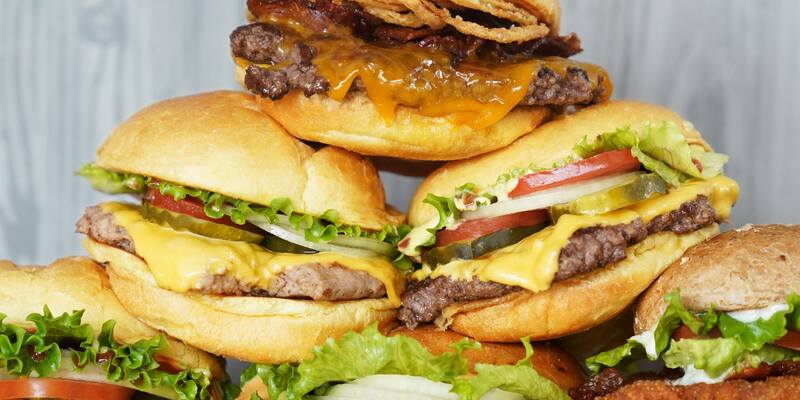 Here are 7 great spots for smashburgers in L.A.
Often imitated but never duplicated, backyard pop-up gone permanent restaurant Burgers Never Say Die can largely be credited with sparking L.A.’s smashburger frenzy. Over the last two years, these stacks have caused so much commotion that they’ve wrapped three-hour lines around the block and once caused a fan to hire a person to wait in line for them. That success probably has something to do with founder Shawn Nee’s quest for perfection, and it’s paid off. Now, fans line up at this walk-up Silver Lake brick-and-mortar for buttery, paper-thin patties pressed so hard, the crisp edges almost resemble lace. Topped with pickles, raw white onions and a drizzle of ketchup and mustard, it’s like the best fast-food burger you’ve ever tried. Supplement with some CVT soft serve and a styrofoam cup brimming with fries, and it’s hard to imagine a more quintessential smashburger meal in L.A.
L.A.’s home to a lot of gastropubs, but a gastropub that nails a perfect burger? Now that’s more of a rarity. At neighborhood spot Electric Owl, the smashburger is king. 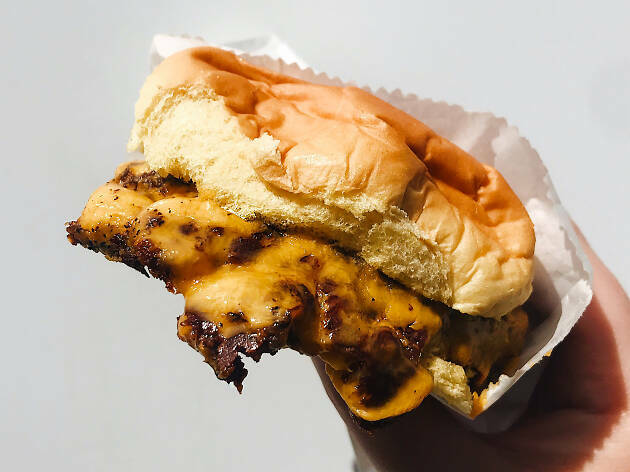 The patty—made from wagyu and dry-aged beef—is a little heftier than the smooshed-thin kin you’ll find on this list, but it’s got a perfect, even char, and comes draped in house-made American cheese. 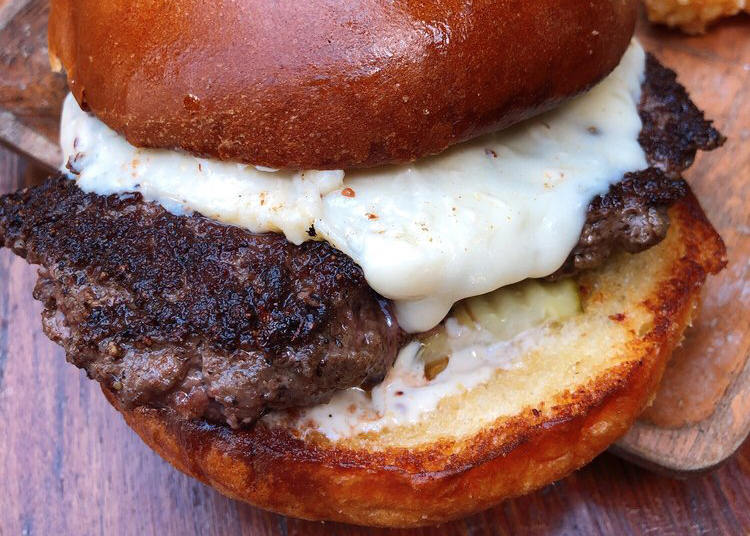 Top it all off with pickles, aioli and griddled shallots, then throw it onto a fluffy bun, and you’ve got yourself one of the city’s most underrated burgers, smashed patty or not. Note: Electric Owl loves the smashburger so much that it even offers a healthier variety, made with a blend of Impossible Foods’ “beef” and regular beef—for half the cholesterol. 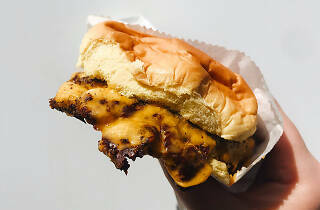 Goldburger’s Allen Yelent gives fans the best of both worlds: a still-juicy center but ample crust. This pop-up’s patties are more pressed around the edges, and topped with American cheese, a little mustard, mayo and either raw or grilled onions. If you’re lucky you just might find the occasional patty melt special, where the smashed patties layer onto Bub and Grandma’s house loaf with cheese and grilled onions. Find Goldburger’s stacks at Dinosaur Coffee on the first and third Sunday of every month (11am–3pm), and at Tabula Rasa Bar on the second Sunday of the month (5–9pm), and keep your eyes on Instagram for updates and additional locations. Beer Belly might be known for its upscale comfort food and massive craft beer list, but even owner Jimmy Han can’t resist the lure of a simple smashburger. He recently teamed up with chef Aaron Lopez, influencer Michael Pak, and athletic group Koreatown Run Club to launch the pop-up Love Hour, where one of the most unique features is the customizable stack. Order singles, doubles, triples or more—someone’s even done a 10-patty burger. They come smashed on the flattop, then crowned with cheese, pickle, onion and the absolute slightest sprinkle of chopped onion. Unlike just about anyone else, Love Hour also offers a range of seasoned fries, tossed to order in flavors like BBQ, garlic-parmesan, and sour cream and onion. These guys pop up all over the city, so be sure to watch Love Hour’s Instagram to catch their next stop. Studio City’s midcentury modern–inspired neighborhood spot is so on board the smashburger trend, the restaurant recently flipped its thicker-pattied burger to a double, smashed-patty variety smothered in American cheese—which is… sort of fitting for a restaurant with an aesthetic flair from the golden age of fast food. But theirs gets a gourmet twist with pickled Fresno chilies and grilled green onion as toppings, and it’s all served on a garlic-aioli–smeared potato bun. We’re partial to the Mister O’s hanger steak, but unlike that gorgous take on beef, the smashburger’s available during lunch and brunch, so we can easily see this becoming our all-day Mister O’s go-to. Is it a chain? Yes. Is it still pretty decent? Also yes. 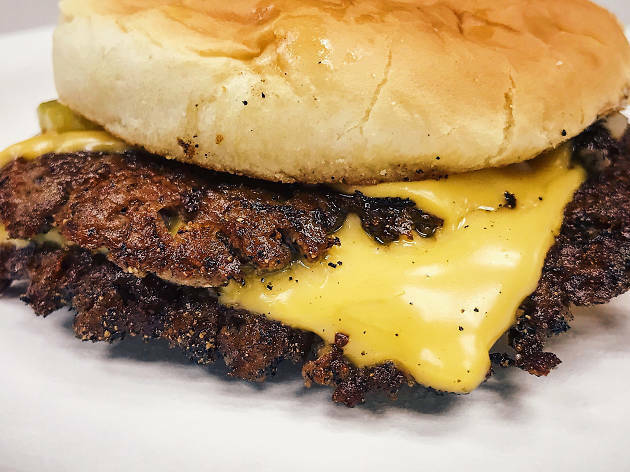 As the name suggests, this Colorado-founded burger company specializes in—you guessed it—smashburgers, seasoned and pressed into the griddle. And because it’s a chain, with necessity of appealing to a large audience, these burgers can get topped with just about anything you can imagine, including truffle mayo, crispy onions, avocado, bacon, ranch, BBQ sauce and blue cheese. Hell, you can even walk in at 10am, add a fried egg and call it breakfast. (Anything with an egg is breakfast.) While we’re all about the local champions on this list, Smashburger isn’t a bad choice if you’re catching a game or a show at LA Live—or if you happen to be on the run in Culver City, at Universal CityWalk, in Carson or in Redondo Beach, where they’ve also planted flags. 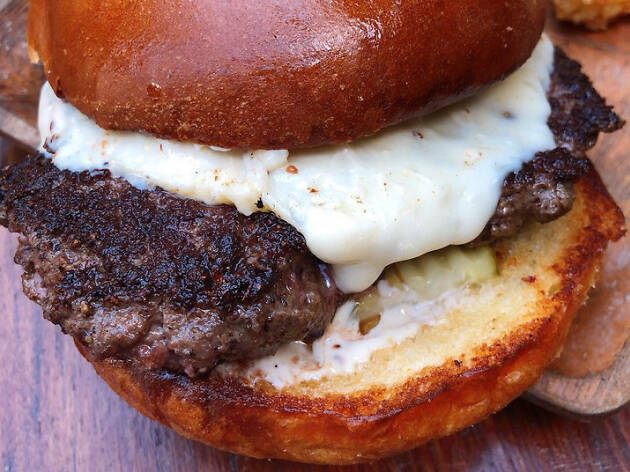 While this Pasadena pop-up’s smashburgers are down for now, they’re not out. 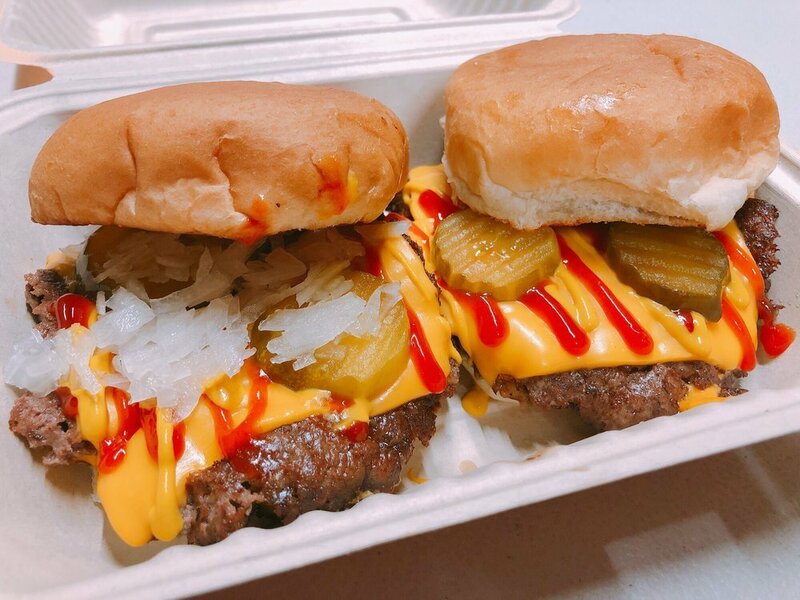 Smosh Town temporarily halted the sale of its pressed wagyu patties, which come decked out with pickle, ketchup and mustard, and served either as “classic” (raw onions) or “O’s Way,” (grilled onions). Prior to closure, lines stretched around the block in front of Gabriel’s Auto Body from Tuesday to Saturday, and the Smosh Town team should soon be back in action, according to their Instagram account. Stay tuned to it for details.